According to a recent report by Grand View Research, Inc., the global market for the mHealth (mobile health) industry will reach $42.12 billion dollars by year 2020. That same year, GSMA estimates that smartphone connections will reach 6 billion, fuelled by growth in the developing world and mobile broadband expansion. The mobile phone market, the largest and most profitable segment of the global device market, is expected to total 1.9 billion units in 2015 alone. With these high expectations for mHealth and smartphone adoption, what are the biggest opportunities for this $42.12 billion market? We discussed this topic when we held a panel discussion in partnership with General Assembly DC at their office in Washington, DC in November 2014. In a rare opportunity to combine both “healthies” and “techies” in one room, we gathered a panel including Arthur Sabintsev, lead mobile architect at ID.me and instructor of General Assembly DC’s Mobile Development classes and workshops; Jessica Taaffe, global health and science consultant and writer at the World Bank; and our own Kendra Keith, mobile health specialist; and TechChange CEO Nick Martin – both of whom have facilitated our popular online course on mHealth. During this hour-long panel, we discussed a wide variety of topics on the mobile applications for public health. Here are some of the highlights of “Mobile Development for Public Health” panel where the panelists shared insights that still ring true across the $42.12 billion dollar mHealth space. The need to strengthen health systems are the biggest challenges for public health, according to Jessica and Kendra, both of whom hold graduate degrees in microbiology and public health, respectively. There are already several great examples of mHealth apps and programs that are strengthening health systems, including MAMA, MedAfrica, Dimagi, CommCare, and others. The ubiquity and diversity of mobile phones and their global usage will be a key driver of the mHealth industry reaching up to tens of billions of dollars, especially as GSMA estimates that there will be one billion unique mobile subscribers by 2020. In their experience teaching the one of TechChange’s most popular online courses on mHealth, Nick and Kendra discussed the unique challenges of mHealth outside developed countries. 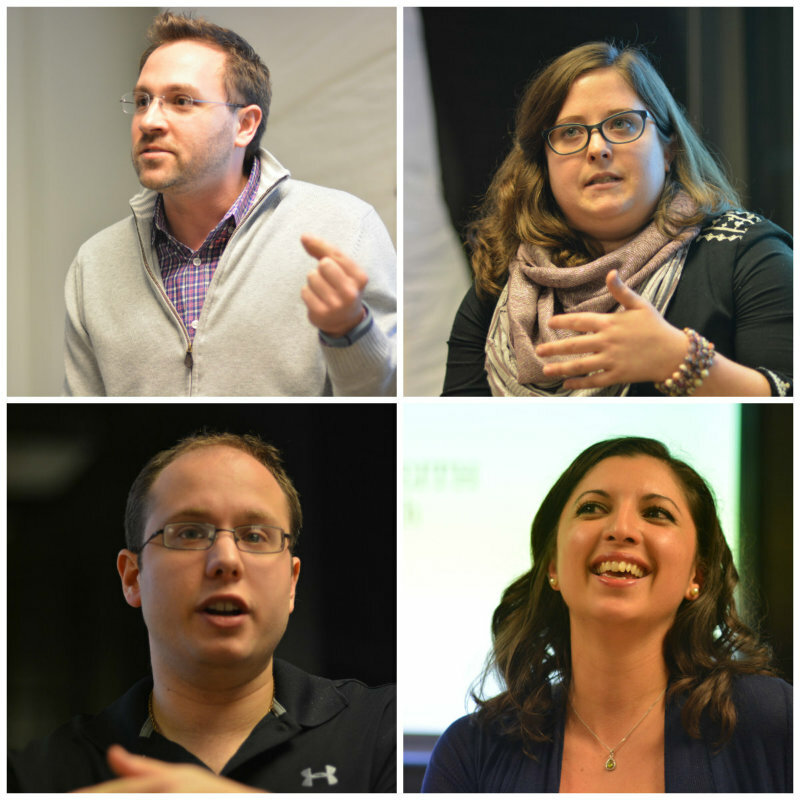 Clockwise from the top-left: TechChange CEO Nick Martin, mobile developer and General Assembly instructor Arthur Sabintsev, global health expert Jessica Taafe, and TechChange mobile specialist Kendra Keith. As a former nuclear scientist turned mobile developer himself, Arthur stressed how there are never enough mobile developers to meet demand in the current global market, much less the global mHealth market. Across the panel, everyone agreed that is it not easy to become a mobile developer, and to keep up with the quickly-evolving skill set demanded for building modern apps. So how do you incentivize mobile developers to build more mHealth apps for public health? Nick mentioned that doing so will not be easy, given that mHealth/public health initiatives are often funded by governments or foundations that have procurement cycles. Though there are some initiatives such as the IBM Watson Venture Fund that has contributed to companies such as WellTok, funding long-term mHealth development has proven tough to sustain so far. Another opportunity for mHealth will be in protecting the data collected in mHealth apps and programs. mHealth is fraught with mobile data security concerns in places where privacy policies are both well-established or barely existent. What opportunities do you see for the growing mHealth global market? Let us know in the comments below, or tweet us @TechChange. If you’re interested in learning more about the opportunities for mHealth, sign up now for our mHealth online course! The next round begins this Monday, 30 March 2015.